, one of the best French comic writers after Moliere, was born at Paris in 1647. He had scarcely finished his studies, when he was seized with a passion for travelling, and an ardent desire to see the different countries of Europe. He went to Italy first, but was unfortunate in his return thence; for, the English vessel bound for Marseilles, on which he embarked at Genoa, was taken in the sea of Provence by the Barbary Corsairs; and he was carried a slave to Algiers. 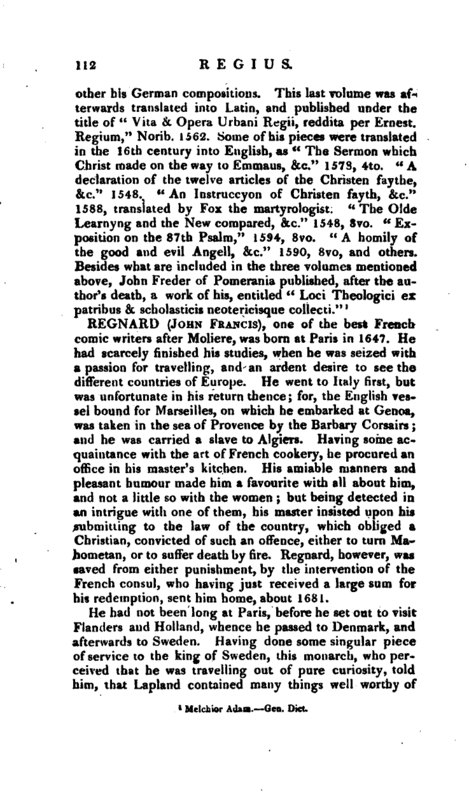 Having some acquaintance with the art of French cookery, he procured an office in his master’s kitchen. His amiable manners and pleasant humour made him a favourite with all about him, and not a little so with the women; but being detected in an intrigue with one of them, his master insisted upon his submitting to the law of the country, which obliged a Christian, convicted of such an offence, either to turn Mahometan, or to suffer death by fire. Regnard, however, was saved from either punishment, by the intervention of the French consul, who having just received a large sum for his redemption, sent him home, about 1681. Hie tandem stetimus, nobis ubi defuit orbis." While he was in Lapland, his curiosity led him to inquire into the pretended magic of the country and he was shewn some of the learned in this black art, who, not succeeding in their operations upon him, pronounced him a greater magician than themselves. 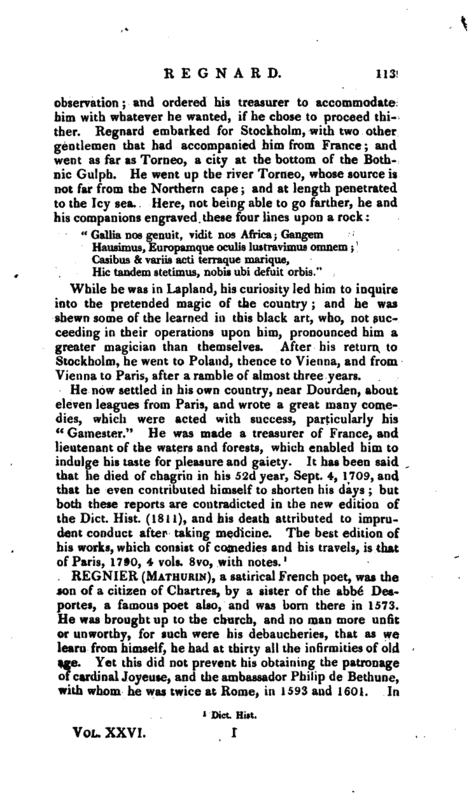 After his return to Stockholm, he went to Poland, thence to Vienna, and from Vienna to Paris, after a ramble of almost three years.